There are many places near Murudeshwar and most of them are must visits. Let’s take a look. Notwithstanding the hackneyed concept of the regular tourists associating a quintessential visit to Karnataka with the capital city Bangalore, the garden city Mysore, and the coffee hill town Chikmagalur, this beautiful state of India has a lot more to offer in terms of pilgrimage sites, flora and fauna habitats and beach destinations. The serene town of Murudeshwar is one such example of the eclectic servings that the town has to offer to the visitors. This picturesque town is nestled on the Arabian Sea, overlooking the lushness of the Western Ghats. Bound by the ocean on one side and green mountains on the other, the town of Murudeshwar is also a sprawling ground for revisiting the religious histories. It’s not a surprise that this town in Karnataka has a gamut of exciting and interesting places to offer to the tourists. The Murudeshwar Temple in the town holds a special fame among the pilgrimage sites in South India, both for its spiritual and religious significance, as well as for its architectural grandeur. Talking about grandeur, how anyone can not talk about the magnanimous statue of Lord Shiva (123 ft.) at Murudeshwar, which also happens to be Lord Shiva’s the second biggest in the world. Also being at Murudeshwar, none misses on a sun-fresh day on the gorgeous Murudeshwar Beach. Apart from the temple, grand statue of the deity, and the beautiful beach on the heart of the town, there are also a number of other adjoining places one must visit around Murudeshwar. Situated 36 km from Murudeshwar, in the Arabian Sea, off the coast of Honnavar Taluk, the Basavaraja Durga Fort was once an island fortress constructed in the 16th century during the Vijaynagar rule. The fort got its name from the Keladi Prince Basavaraja, after the Shivappa Nayaka, Keladi ruler, captured the fort and gave it the name in memory of the Prince. The fort is built at a height of 50 meter above the sea level on a 19 hectares island replete with trees and dry grass. The huge laterite blocks fortifying the fort, as well as the eight ruined mounted guns are the only remains of the mega structure. Apart from the fort, the island has a number of fresh water wells and an ancient temple where the fishermen and the boatmen offer annual prayers. Spending half a day on the island won’t be a bad idea at all. 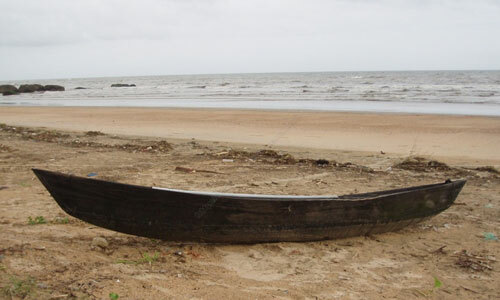 Take a boat or ferry from Pavinakurva village or Honnavar to reach the island. One of the best places near Murudeshwar, Bhatkal is a picturesque port town on the National Highway 17, only 13 km from Murudeshwar. Apart from its jaw-dropping views of the Arabian Sea, Bhatkal is also known for its ancient Jain monuments, as well as its historic temples built during the reigns of the Vijaynagar Kingdom. The Kethapayya Narayan temple at Mud Bhatkal is a living testimony to the temples built under the Vijaynagar Empire, while the temples of Chandranath Basadi and Parshwanath Basadi are the prehistoric Jain structures that have managed to defy the ravaging tests of time. Another significant testament of the rich history of India is the Jamia Masjid at Bhatkal. This old mosque stands glorious in a sprawling three-storey structure. The Persian inscriptions found in this mosque reverberates a succulent story of the past. If these ancient temples, mosques and structures make Bhatkal a hot favorite among the history and archaeology enthusiasts, the gorgeous Bhatkal Beach in itself is a reason worthy enough to visit this port town near Murudeshwar. The town isn’t only about cultural or nature tourism. Places near Murudeshwar promise a good day of excitement to the adventure lovers as well. The little island in the Arabian Sea called the Netragudo & Pigeon Island or the Netrani Island is a haven for underwater actions like snorkeling and diving. A large variety of corals, butterfly fish, triggerfish, eels, and shrimps are seen around the island. Besides, it’s also said that the Whale Sharks hover around the island. Composed of cragged terrains, the Netrani Island houses a ruined temple, a mosque and a Roman Catholic Church. If you are a water-child, now you know where to look for adventure at the town. Baindur is a tiny town situated on the National Highway 17, between Murudeshwar and Udupi. This idyllic town is augmented in its scenic charm by the pristine beach in the Arabian Sea. The adventurous lots can try hands in a number of water sports. It also won’t be an exaggeration to call Baindur a temple town. With four prominent temples nestled in this town, namely, Sri Seneshwara Temple, Sri Mahakali Temple, Sri Sita Ramachandra Temple and Sri Someshwara Temple, Baindur is a pilgrimage destination as well. Among these temples, Sri Someshwara Temple looks most picturesque being situated on the stunning Baindur Beach. A drive from Murudeshwara for around 75 km, one reaches the overbearing Kodachadri peak in the Western Ghats. With an altitude of 1343 meter, Kodachadri is an Eden for trekkers. Legends say that Saint Shankaracharya meditated on this hill. There’s a Sarvajna Peetha located at the pinnacle of the hill. A special treat gleefully waits on the trekking route in the form of the frolicking Hidlumane Falls. It’s a series of six milky waterfalls promising to give the trekkers a memorable company in their expedition. Accommodations are available on the hilltop, including a forest guest house. The small town of Gokarna, one of the best places near Murudeshwar, is a renowned pilgrimage center and an astounding beach station. Thousands of people visit the town every year for offering prayers at the famous Mahabaleshwar Temple. The Atma Linga given to Ravana by Lord Shiva is installed in the temple. The temple is especially a treat to the eyes during the Maha Shiv Ratri and the Kartika Purnima, when the entire building is illuminated. Apart from the Mahabaleshwar Temple, there are a number of other prominent temples as well, like the Maha Ganapathi temple, the Bhadrakali Temple, the Varadaraja temple and the Venkataramana temple. Like Banaras, Gokarna is also considered a Muki Sthal, where the Hindus perform the last rites. Not just the temples, the beaches in Gokarna have also contributed to the fame of this town. The five main beaches here are: Om Beach, Gokarna Beach, Kudle Beach, Half Moon Beach and Paradise Beach. The beaches are dotted with pretty shacks, tiny shops and contemporary eateries, serving comfort and luxury to the visitors. If visiting Gokarna, make sure not to miss the Mirjan Fort. Situated only 22 km from Gokarna in the Mirjan village, the fort is bestowed with grandeur and a rich history. This fort on the banks of the Aganashini River is of sheer pleasure to the eyes due to its architectural grace. The double-walled fort made of laterite stones is spread over a vast area of 10 acres. The Mirjan Fort has four entrances, and is approached through a flight of wide stairs leading into the fort’s interior. A special mention for the moat surrounding the fort with interconnected wells. Angels are believed to have bathed in the Apsara Konda Falls. Only 20 km from Murudeshwar, the fall cascades down from a height of 10 meters into a sea-facing pond that looks like a lagoon. Although it’s a relatively small waterfall, the dense greenery surrounding it, as well as the little lagoon-like pond the waterfalls into lends the Apsara Konda Falls a mythical touch, as if the fairies must have definitely hid themselves here behind the greenery for a sublime bath. The pond is safe for swimming. Following a good swim at the pond, it would be a good idea to take a few minutes’ walk to a viewpoint in the magnificent Apsara Konda Hill. This hill has several small and big caves called the Pandava Caves. There is a belief that the Pandavas had stayed in these caves while they were on an exile. After the experiences at the waterfall and the hill, one would surely love to wrap it up with a visit to the nearby Kasarkod Beach. 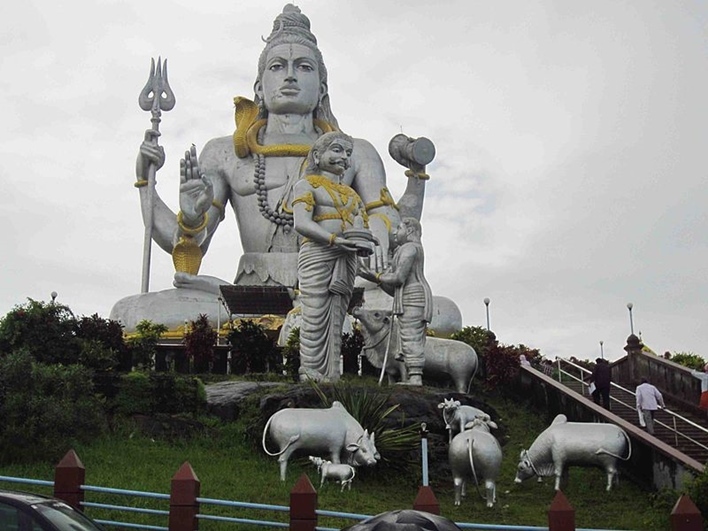 When in Murudeshwar, don’t forget to visit the above mentioned places near Murudeshwar. They are absolutely stunning.